Stay out of the sun, and get comfortable with this easy pop up outdoor tent. This Fire-Retardant and weather resistant display is priced economically to protect you while displaying in any outdoor environment. 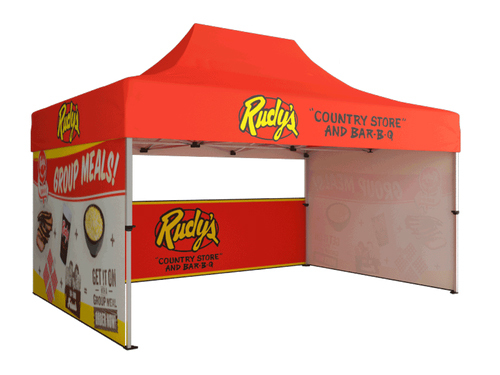 Complete with your choice of unprinted color, this outdoor event tent makes it easy to simply pop up, and be ready for fun! Choose between 7 color options, or even add side and back walls. Be sure to upgrade to a printed version if you plan on printing your logo or full graphics on these outdoor displays. Peak Imprint: 52"" x 28""
Valance Imprint: 78"" x 10""
66" x 12" x 13"